On May 24, the Congressional Budget Office (CBO) released its analysis of the President’s budget for fiscal year 2019. Compared with the baseline (which assumes that current law would generally remain the same), the President’s budget would reduce future deficits and would generate a smaller federal debt as a percentage of gross domestic product (GDP). Most of the savings would be generated by reducing non-defense discretionary spending, an outcome which is unlikely to come to pass judging from the increase in the cap for 2019 for such spending enacted in the Bipartisan Budget Act of 2018 shortly after the budget was released. Moreover, debt would remain on an upward trajectory and the underlying imbalance caused by growth in spending targeted towards older Americans coupled with inadequate revenues would still remain. CBO reports that the President’s policies would decrease deficits between 2019 and 2028 relative to the baseline from $12.4 trillion to $9.5 trillion—a reduction of $2.9 trillion. Spending would be reduced by $3.5 trillion, partially offset by a reduction of revenues of $0.6 trillion. The majority of spending cuts would come from reductions in in non-defense discretionary programs, which currently make up only 15% of total government spending. Substantial reductions would also be made to Medicaid and other health programs. The federal debt relative to GDP would reach 86.4 percent by 2028, more than double its level over the past 50 years and the highest since 1947. CBO projects that, over the next 10 years, the economy will grow by an average of 1.8%. CBO’s estimate of the cumulative deficit over the next 10 years totals $2.3 trillion more than the Administration had estimated. In the coming years, as the large baby boom generation retires, life expectancy rises, and healthcare costs continue to grow, our budget will be under enormous strain and our current tax system unable to keep up. Following recent tax and spending legislation that will add significantly to our national debt, there is an urgent need for the President and the Congress to come together for a fiscal reset that puts America on a sustainable course for economic growth and prosperity. The President’s policies sharply reduce spending, while revenues will largely stay the same. According to CBO, the President’s budget would reduce spending by $3.5 trillion over the next 10 years, while revenues would decrease by $0.6 trillion. The only major policy proposal affecting revenues is that the Administration would extend provisions of the recently enacted Tax Cuts and Jobs Act that are slated to expire in December 2025, which would decrease the amount of revenues that would be collected during 2026 to 2028. More than half of the reductions in spending stem from cuts to discretionary programs. In particular, appropriations for non-defense discretionary programs—which fund a variety of government activities including scientific and medical research, education, infrastructure, national parks, law enforcement, grants to state and local governments, and pay for federal workers—would be more than $50 billion below the amount agreed upon for 2019 in the Bipartisan Budget Act of 2018. Overall, reductions in spending for non-defense discretionary programs (other than that designated for overseas contingency operations, or OCO) would total $2.1 trillion between 2019 and 2028. Defense spending (other than that designated for OCO) would be increased by $674 billion over 10 years. OCO outlays would fall by $400 billion from 2019 through 2028. Under the President’s budget, mandatory spending would be reduced by about $1.3 trillion over the 10-year period. Nearly all of that total would stem from reductions in federal healthcare programs, specifically Medicaid and subsidies for health insurance coverage purchased through the marketplaces established by the Affordable Care Act. Changes to federal student loans would reduce outlays by $103 billion and cuts to spending on income security programs (such as the Supplemental Nutrition Assistance Program) would reduce outlays by $97 billion. Reductions to those programs are offset, in part, by the provision of $131 billion in funding for infrastructure. Debt will remain at historically high levels under the President’s budget. According to CBO, the federal debt would reach 86.4% of GDP in 2028, more than double the average over the past 50 years and 10 percentage points above the ratio at the end of 2017. Since 1790, there have only been six years in which the debt was higher than it is today, and those were during and just after World War II. After the war, debt began to fall sharply as a share of GDP as the economy grew and some debt was paid down. 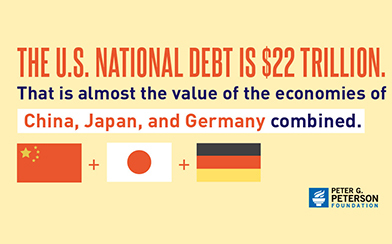 Today, however, our growing debt is caused by a structural mismatch between spending and revenues. CBO assumes slower economic growth than the Administration, which is a large factor in accounting for CBO’s finding that deficits would be larger than claimed by the Administration. Over the next 10 years, CBO forecasts average growth of about 1.8 percent while the Administration assumes that GDP will grow nearly 3 percent on average. Private-sector forecasts, such as the Blue Chip projections, are in line with CBO’s economic projections. Overall, CBO estimates that the 10-year deficit will be $2.3 trillion larger than OMB reported in the President’s budget. OMB’s optimistic assumptions about economic growth account for some large differences in budget projections between the Administration and CBO. In particular, CBO estimates that revenues will be about $2 trillion less over 10 years than does OMB, mainly because of lower projections of wages and salaries. CBO’s estimate of outlays between 2019 and 2028 under the President’s budget is $348 billion above that of the Administration. Differences in projections of mandatory and discretionary spending largely offset each other. CBO’s estimate of interest costs is $417 billion higher over 10 years because of additional debt-service payments and higher projected interest rates. Debt vs. Deficits: What's the Difference?